Oval Space Music brings you a very special extended late night session with one of the industry’s freshest talents, Evian Christ. On Friday 21st of March join us for an exclusive live performance, with a specially curated line-up from the man himself. British artist Evian Christ has been on the ascent since the release of mixtape ‘Kings And Them’ in 2012. Released through Tri Angle, establishing the young producer as a breakthrough artist, Evian Christ has since played shows across the world with the likes of Purity Ring, Actress and Four Tet. Releasing ‘Duga-3’, a 20 minute long, highly conceptual, experimental piece arranged in four seamless parts showed yet another side to his hip hop oriented work. A notably talented musician, Evian has also taken part in a unique sound art installation with Matthew Barney, and most famously produced on ‘I’m In It’ which featured on Kanye West’s ‘Yeezus’ long player. 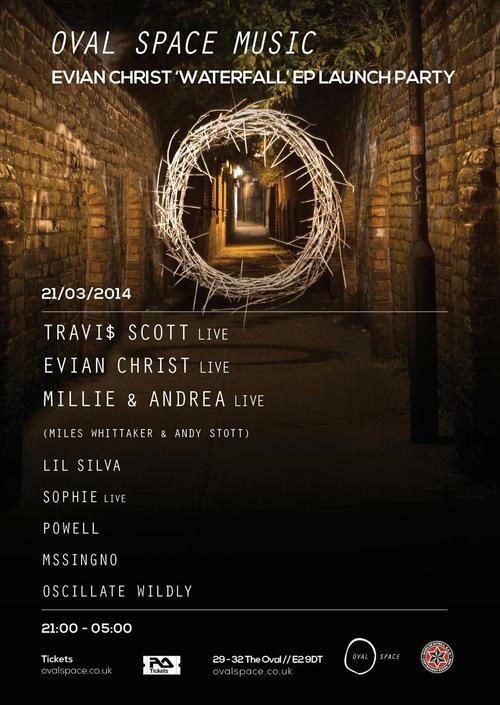 With a fresh EP titled ‘Waterfall’ set to drop in early 2014, Evian Christ’s live show is not one to be missed. All events are 18+ unless otherwise stated.